According to local legend, a night watchman, making his rounds during a storm, came across Inez's grave and saw that the box was empty. He fled, never to return. The next morning, the statue of the little girl was back in its usual place. 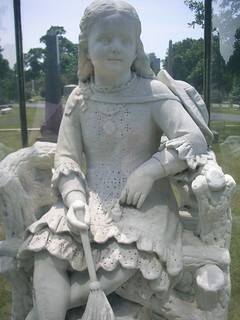 Others have claimed to have briefly glimpsed a small child in 19th-century dress wandering through the cemetery. Inez's grave remains popular today, perhaps due to the high quality of the likeness. The image remains in nearly perfect condition thanks to its protection from the elements. Gifts of flowers and toys can often be found at the base of the glass box. Around April of 1997, Inez Clarke's grave was vandalized. A large gouge was made in the front panel of the box, probably by an axe. The vandals evidently fled before they were able to penetrate the thick plexiglass, and the marble statue inside was unharmed. The front panel has since been replaced.